Do you need vinyl banners for your company or organization? Our vinyl banners are printed using the most advanced technology and printers available. We produce full color custom vinyl banners using your graphics and artwork. Banners are hemmed with a double locking stitch on all four sides for strength and have brass grommets in the corners and along edges, if size warrants. 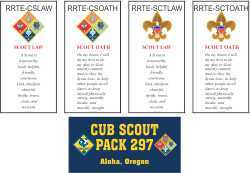 We can provide your Scout Pack with its own Banner for use in parades and recruiting. The Pack banner is 30"x 5' and has pole pockets at the top and bottom and grommets in the corners. The price is $80.55, plus shipping. Estimated UPS ground shipping is $22-$25. Just click on the following image for larger view of the banners. Vinyl banner pricing depends on size and the quantity you order. We can make any size banner you need. Just call or email with your requirements and we will gladly provide you a price quote. If you already know what you want on your banner, just email us the design. Otherwise we will gladly help you design your banner. A banner proof is emailed to you for your approval before production begins on your order. All production is done at our production facility located in Texas, and we normally ship within 48 hours after you approve the proof. Just call 903-463-4018 or email with any questions.